Kevin Carlson provided this low-resolution version of his class picture. You can order full quality 8x10 print for $15 postpaid from Carlson's Studio, 2110 Sayre Road, Wyoming, NY 14591, 585-786-2871. If you try to print this picture, you will be disappointed in the quality - it is intentionally reduced to just enough quality for a web page, not for printing. The picture you get from Carlson's Studio will be full quality. 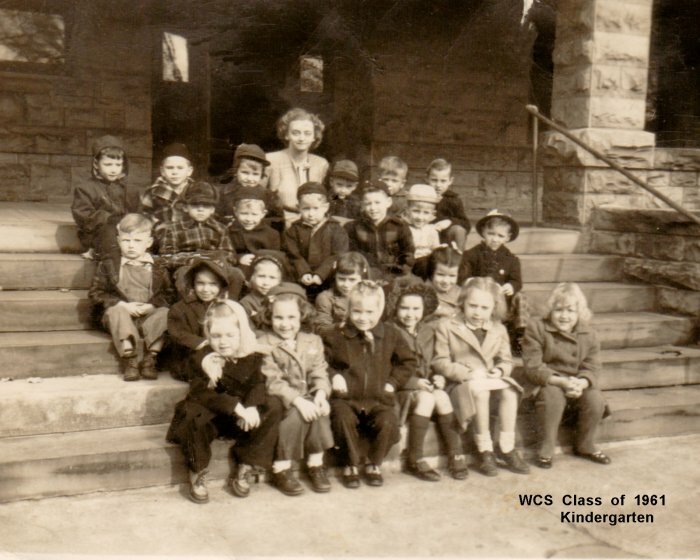 The only other picture so far is this class picture... from a few years earlier (kindergarten), courtesy of Carl Eisenhard. We sure have changed. Hopefully you will be sending more pictures for here as soon as you recover from the reunion parties.